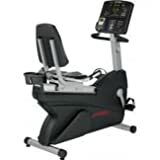 The Life Fitness Club Series Lifecycle Recumbent Exercise Bike has mastered the combination of motivating workouts with incredible comfort. On one side of this equation is the world-reowned appeal of the Lifecycle bike’s quality, reliability, and durability. The other side of the equation consists of the ergonomics, biomechanics, and comfort that go into creating the best in recumbent cycling. With an Club Series, top-quality workouts and comfort unite in the most remarkable ways. Once you lean back in the seat on a Lifecycle recumbent bike, you’ll notice how it accommodates your size, your abilities, and your preferences. HeartsyncTM Workouts: Cardio, Fat Burn, Heart Rate HillTM, Heart Rate IntervalTM, Extreme Heart RateTM. Workout PlusTM workouts: Around the World, Cascades, Foothills, Interval, Kilimanjaro, Speed Training. My WorkoutsTM : 7 user defined programs. Other Workouts: Quick Start, On-The-Fly Programming, Cool Down Mode. Heart Rate Monitoring: LifepulseTM digital heart rate monitroing system with DSP (Digital Signal Processing). Polar telemetry heart rate monitoring (wireless strap included). Workout ProfileTM display: 7 x 15 LED segment with Time, Distance, RPM (speed), Level, Calories, Heart Rate, Calories Per Hour, and Watts. PedalsWide RideTM self-levelling pedals with straps. Frame2″ x 4″ (5 x 10cm) robotically welded steel frame. Life Fitness Club Series Bike Home Warranty: 3 years parts & labour. Delivery is included in the Gymworld buying price of this product. For our Amazon customers we also include installation service at the same time as delivery, available in most GB mainland areas. Our installers will also remove and dispose of all packaging materials as well as take away for disposal one piece of unwanted fitness equipment. Please allow approx 7-14 for this service, a member of staff will contact you to make arrangements. This entry was posted in Fitness Products and tagged Bike, Club, CSLR, Exercise, Fitness, Life, Lifecycle, Recumbent, Series by Summer 365. Bookmark the permalink.